SuperC Touch’s “Perturbation Resonance” technology enables to magnify capacitive sensing signals but keep the noise unchanged. By way of this method, the ratio of signal over noise (S/N ratio) can be significantly increased, and sensing a signal with a magnitude as small as aF is feasible. It now can be used to overcome ambient noise in capacitive sensing, increase the signal penetration thickness of cover in fingerprint sensing, and significantly increase the height of hovering in self-capacitive touch. Patents regarding the core circuit of this technology have been granted in six areas in the world, including Taiwan, China, United States, Japan, Korea, and European Unit. Off-Chip herein stands for a type of fingerprint sensing technology in that the sensor is independently separated from control IC. The sensor electrodes and circuits are manufactured on glass/plastic substrates via display TFT/Array processes, and the sensed signals are transmitted through traces on COF to control IC, which differentiates itself from the current capacitive fingerprint technology that is manufactured on wafers. The advantages of off-chip fingerprint sensing technology encompasses large scale and low cost (one-third of the cost of the current technology), that can challenge and replace the current technology in the market. In addition, off-chip sensor on plastic substrate is bendable, and is good to be used for card market. However, one challenge of making an off-chip fingerprint sensor is that the sensed signals have to pass through long traces before arriving at control IC. The area of a trace line is at least over one thousand times of the area of a sensing pad so that large ambient noises would add on the sensed signals, lowering the sensing and identification capability. The SuperC Touch’s core technology “Perturbation Resonance” has the feature of significantly magnifying the signal and still keeping the noise of the same level. That is the critical technology to overcome this challenge. 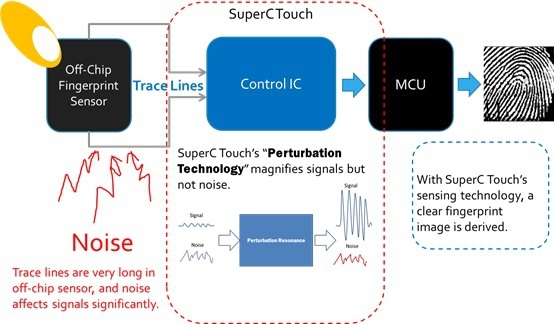 Therefore, off-chip fingerprint sensor using SuperC Touch’s sensing technology still have superior sensing and identification capability compared to the commercial capacitive ones.